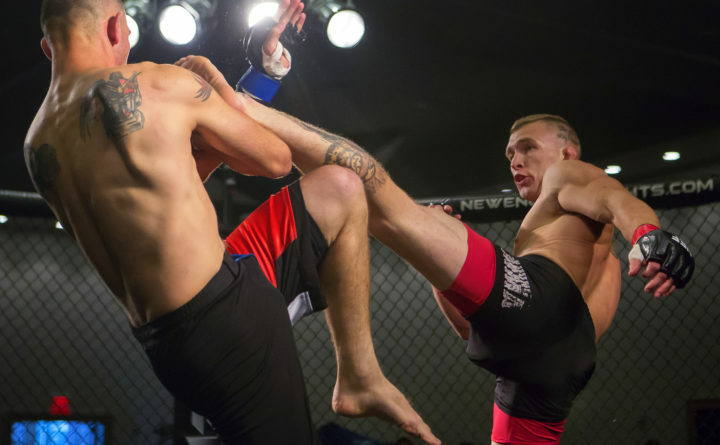 Young's MMA's Josh Harvey (right) lands a kick to the face of Zenon Herrera during their featherweight bout as part of the reality program "Dana White: Lookin' For A Fight" event in the grand ballroom at the Cross Insurance Center in Bangor in this Aug. 5, 2016, file photo. Josh Harvey’s big meal Wednesday reflected his continuing weight cut in advance of Friday night’s NEF 37 mixed martial arts show at the Cross Insurance Center in Bangor. Three egg whites and a vegetable medley, all stir-fried with sundried tomatoes and washed down by a half-pot of pecan black coffee, was the order of the day. The undefeated combatant from Young’s MMA in Bangor is preparing to fight at 145 pounds for the first time in nearly two years when he faces Bill Jones of Berwick for the New England Fights pro featherweight title. And he didn’t — Harvey weighed in at exactly 145 pounds on his second try during Thursday afternoon’s weigh-ins. The Harvey-Jones bout is one of 11 contests — two pro fights and nine amateur bouts — scheduled for NEF 37. The action set to begin at 8 p.m. The 28-year-old Harvey, the Class C wrestling state champion from Dexter Regional High School in 2007 and 2008, and the former NEF amateur lightweight champion, was especially keen on making weight. For his last bout both he and his last opponent, recent UFC “The Ultimate Fighter” finalist Joe Giannetti, both failed to make weight for their lightweight bout in November. That bout ended in a controversial majority draw, with most cageside observers believing Harvey won the match on Giannetti’s home turf in Plymouth, Massachusetts. Harvey, who took the Giannetti fight on short notice and blamed his weight issue on relaxing his diet after scoring a first-round stoppage of Jay Ellis in Bangor less than two months earlier, appealed the decision to the Massachusetts State Athletic Commission. That organization declined to review the decision. Harvey will be fighting in his preferred featherweight division for the first time since scoring a first-round stoppage of Derek Shorey in Lewiston on April 29, 2017. The 40-year-old Jones, who trains at Nostos MMA in Somersworth, New Hampshire, is a veteran of 24 MMA matches (13-11), including one bout with the World Series of Fighting promotion. “With the experience he has in MMA he’s going to be very fight savvy,” Harvey said. “He’s cool, calm and collected, and I feel like I’m very cool, calm and collected, too, which is important because when you stop thinking and start reacting just on emotions you start fighting dumb.